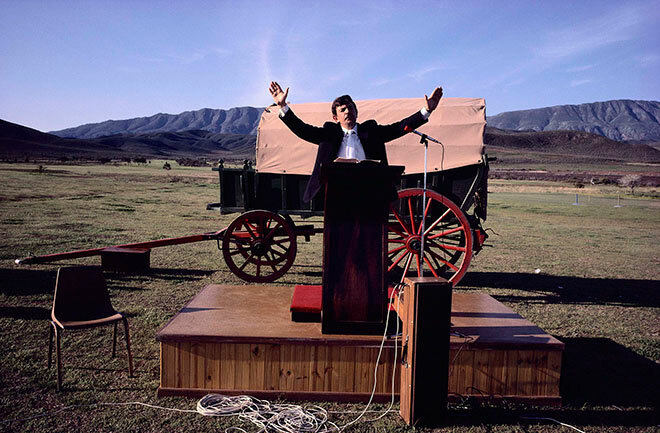 Pastor Johan Rossouw of the Dutch Reformed Church delivers an open-air church service during the FAK trek re-enactment festivities at Bonnievale in the Boland Mountains. In my white South African education I was taught year on year about the ‘Great Trek’. I learnt about the heroic courage of the Voortrekkers who, in 1838, had embarked on an epic journey into the unpopulated interior of Southern Africa in search of freedom from British tyranny and lands of their own. We were not taught about the tremendous destruction, upheaval and suffering that this caused the black tribes who occupied the land. 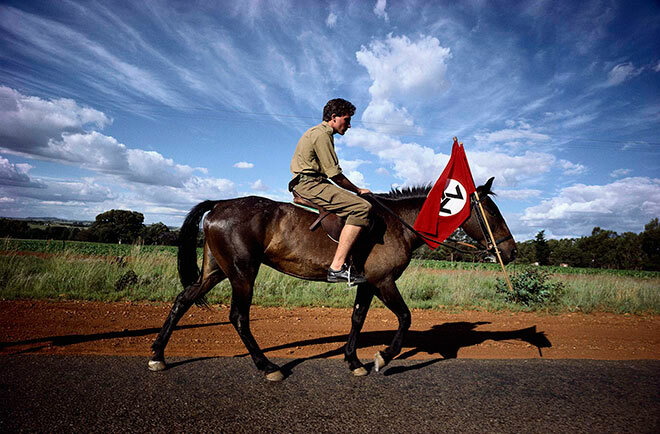 One hundred years later, in 1938, the Great Trek’s anniversary was celebrated in a passionate nationwide event. The architects of this fabricated folk memory were inspired by the ideology of Aryan purity and Nazi methods of mass mobilization. Just ten years later, the National Party took power using the new slogan of ‘apartheid’ to win the election among white voters, and the story of the Great Trek became apartheid’s founding myth. These photographs were taken just fifty years later, during the troubled celebrations to mark the 150th anniversary of the Great Trek. 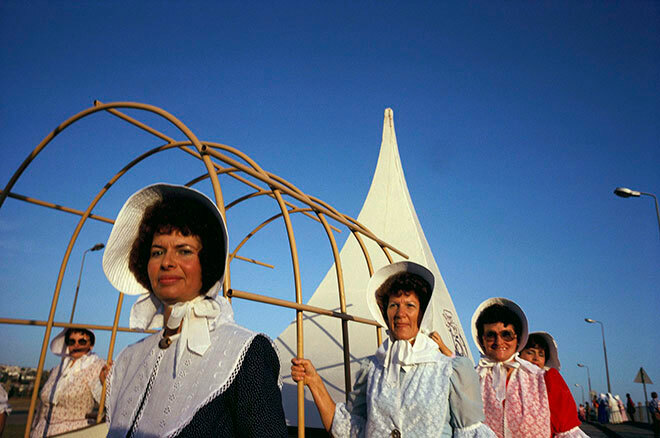 After years of bitter struggle against anti-apartheid forces, the cultural institutions of the ruling Afrikaners were divided and in a state of confusion. Rather than functioning as a unifying symbolic journey, three competing re-enactments took place. The events failed to attract much public support and instead appeared as a form of outdated bureaucratic ritual. An exhibition of this work in 1989 sparked controversy, particularly after the framed prints were ceremoniously removed by a group of black actors who were performing in a play to commemorate the 1976 Soweto massacre. A debate raged about what the proper role of photography should be in documenting the white establishment, and whether this work was glorifying white right wing groupings or whether it was oppositional. I chose to withdraw these images from public display for many years, however with the passing of time I have come to see their significance. They portray a last grasp at a mythology that could no longer sustain a violent and brutal regime. 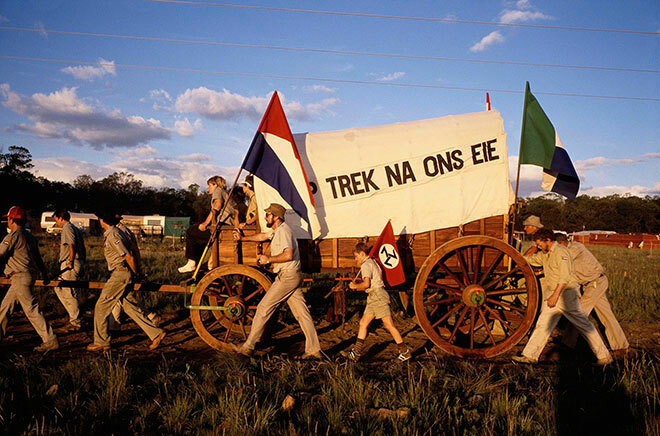 Pierre van Zyl, the blind wagon commander of the FAK trek rides in the wagon as it heads through the Boland mountains towards Swellendam, preceded by marching Voortrekker youths. He was a farmer from Lichtenburg who provided 12 black labourers to accompany the trek. 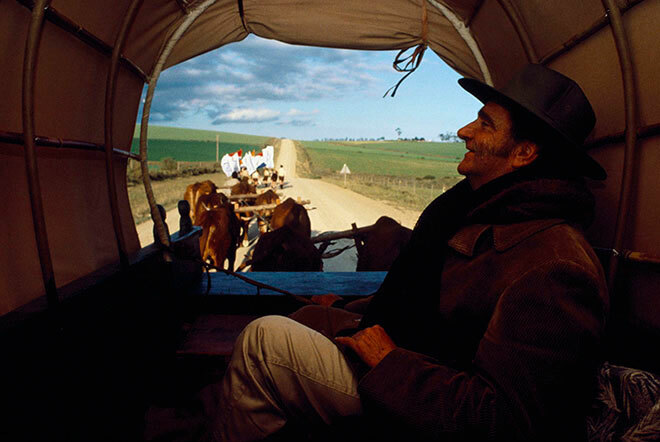 The AWB wagon is pulled by hand through the Natal countryside on Kruger Day, the day of its ceremonial departure from Blood River. This was the only wagon that actually rolled over its entire route without being transported. 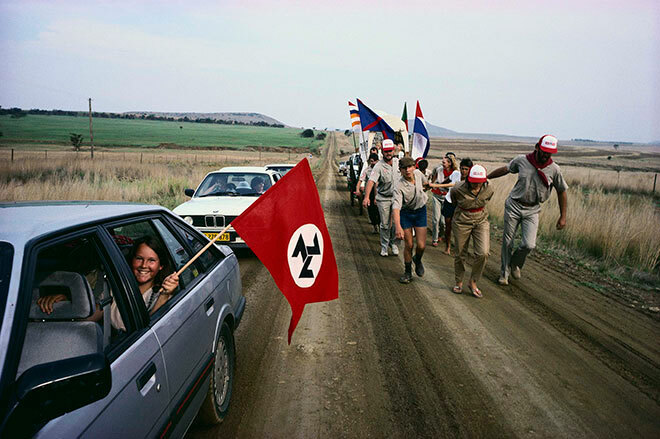 One of the architecturally symbolic wagons of the Afrikaner Volkswag Trek. It formed part of the parade entering Port Elizabeth. The AWB wagon nears the end of its hand pulled journey as it nears the Donkershoek site on the outskirts of Pretoria, where its trek from Blood River in Natal will conclude. The slogan “Op trek na ons eie” means ‘On the journey to our own’. A lone horseman rides ahead of the hand-drawn AWB wagon as it travels the last few kilometers of its long journey for the Great Trek re-enactment. The FAK wagon travels through the Boland Mountains en-route to Great Trek re-enactment festivities in Swellendam. 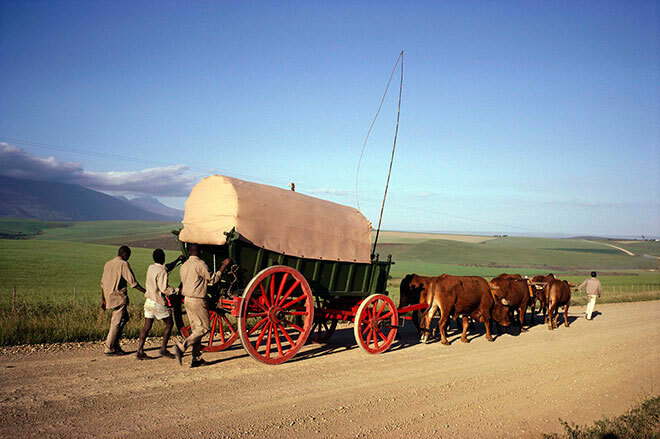 The black labourers were inexperienced at handling oxen, so the wagon arrived late. Shortly after this, the plan for the wagon to actually travel from city to city was abandoned and it was subsequently transported by truck. 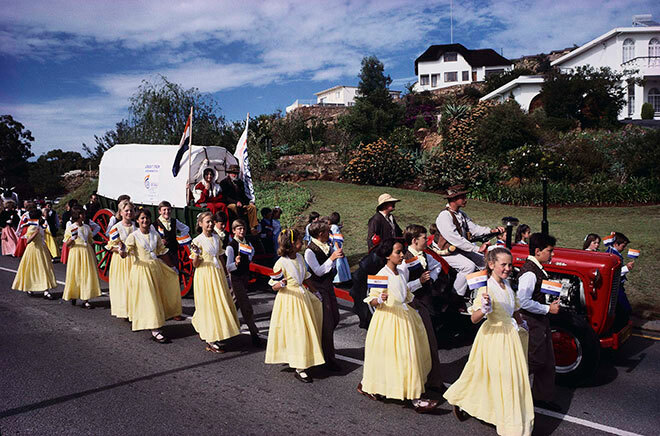 A group of schoolchildren in Voortrekker dress is part of the FAK trek parade festivities in Randburg. By this point the FAK had given up on trying to pull their wagon by ox and were using a tractor instead. A lager (circle of wagons) is set up during a re-enactment of the Battle of Blood River, performed on the farm Donkerhoek outside Pretoria for the concluding Volkswag and AWB ceremonies. The battle was acted out complete with horse commandos charging in and out of the lager, and rifle and canon shots. The Zulu enemy was represented by sound effects played over loudspeakers. 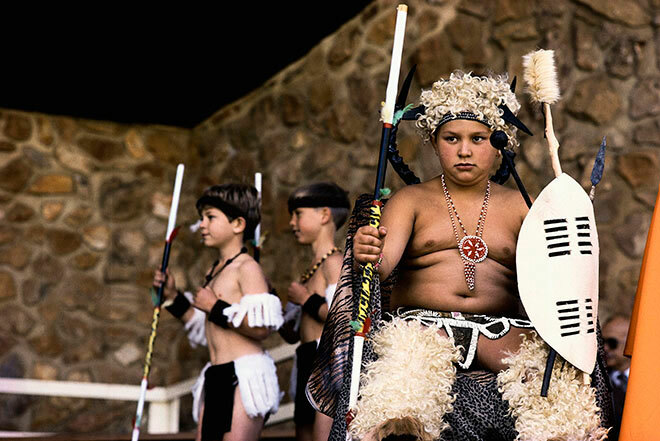 The role of Shaka, a Zulu chief in the Battle of Blood River, is played by a white schoolboy during a Great Trek re-enactment event. This was organised by the Afrikaner Vokswag in Randburg. 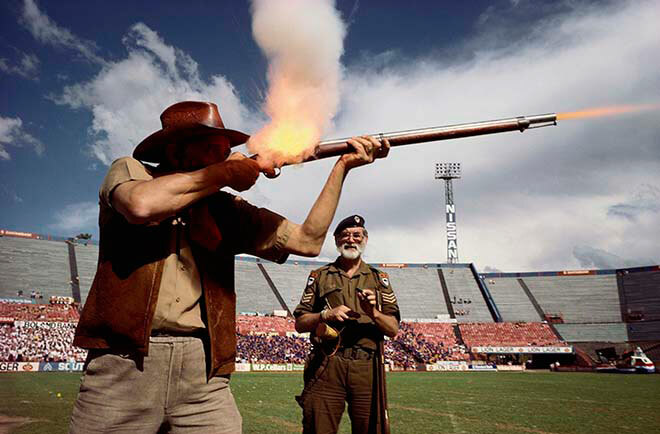 An old Voortrekker flintlock weapon is fired at a demonstration during the FAK Great Trek festivities at a Pretoria stadium. 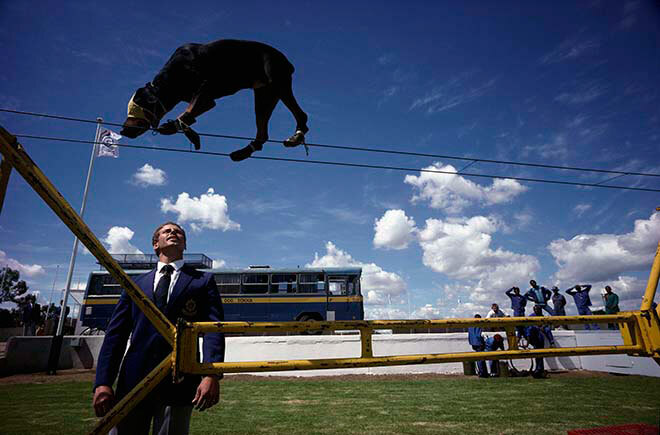 A display by the police dog school is one of the events put on during the FAK Great Trek re-enactment festivities at the Voortrekker Monument. 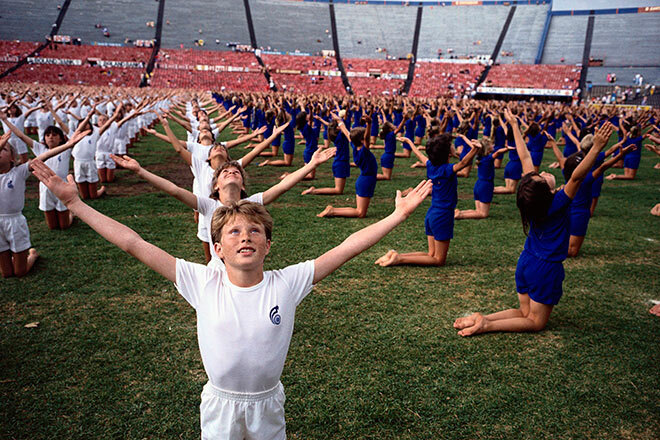 Schoolchildren participate in a display of mass formation gymnastics during one of the cultural events put on by the FAK for the conclusion of their Great Trek re-enactment in Pretoria.